Massage Oils: Aura Cacia, Khepra Skincare, Home Health, FES! Massage Oil: Creates the perfect glide and control for the duration of the massage. Helps penetrate, soften, invigorate, and nurtures the skin. Does not dry up with use, no oily residue after a massage, and the oil leaves skin smooth and silky. Made with rich set of base oils that includes cold-pressed sweet Almond oil, Canola oil, Grapeseed oil, Apricot kernel oil, Avocado oil, and Aloe Vera oil. Water dispersible to reduce staining on linens. • Massage Oil Egyptian Aura: Bitter Almond, Cedarwood, Eucalyptus, Frankincense, Lavender, Myrrh, Sandalwood, Tea Tree. 8 oz. ORDER NOW! Ingredients: Sweet Almond Oil, Canola Oil,Grapeseed Oil, Apricot Kernel Oil, Avocado Oil, Aloe Vera Oil, Vitamin E, Sweet Almond Glycerides. ESSENTIAL OILS: Myrrh, Frankincense, Sandalwood, Eucalyptus, Lavender, Cedarwood, Tea Tree, And Bitter Almond. • Massage Oil Essence of the Nile: Bitter Almond, Cedarwood, Eucalyptus, Frankincense, Gardenia, Grapefruit, Lavender, Myrrh, Sandalwood, Tea tree. 8 oz. ORDER NOW! Ingredients: Sweet Almond Oil, Coconut Oil, Grapeseed Oil, Apricot Kernel Oil, Avocado Oil, Aloe Vera Oil, Vitamin E, Sweet Almond Glycerides, ESSENTIAL OILS: Myrrh, frankincense, grapefruit, lavender, sandalwood, cedarwood, eucalyptus, gardenia, tea tree, bitter almond. • Massage Oil Fragrance Free: 8 oz. ORDER NOW! MASSAGE OIL: Massage Oil, 8 oz. • 100% Pure Jojoba Oil: Pressed from plant seeds native to the American Southwest, jojoba oil is a natural, time-honored moisturizer for skin and hair. Moisturizes skin without leaving any oily residue and helps prevent flakiness when massaged on scalp. Effectively cleanses clogged pores. Suitable for even the most sensitive skin, it penetrates quickly after application, and also makes for an enriching aftershave moisturizer. Great for a massage therapist or for use at home. Soften your hands and feet, by massaging them with Jojoba Oil after bathing. Treat your hair and scalp to a rejuvenating massage with Jojoba Oil especially good for moisturizing the scalp and to prevent dry skin or dandruff. 4 oz. ORDER NOW! • Thoroughly Clean Oil Control Lotion: Organic chamomile and lavender oil are formulated with the natural antiseptic properties of tea tree oil to help soothe and calm skin, even while improving texture and clarity. Heavy on hydration and easy on your pores, this lightweight moisturizer controls oils and leaves a matte finish so your skin looks refreshed and healthy. Hydrates oily/combination skin without clogging pores. Helps reduce oil and blemishes and leaves skin velvety smooth shine-free. Massage a small amount over face in the morning, avoiding eye area. 4 oz. ORDER NOW! Ingredients: Water (Aqua), Hamamelis Virginiana (Witch Hazel) Leaf Extract, Chamomilla Recutita (Matricaria) Flower Extract, Calendula Officinalis Flower Extract, Fucus Vesiculosus Extract (Bladderwrack), Hydrastis Canadensis (Goldenseal) Extract, Hedychium Coronarium Root Extract (Hawaiian White Ginger), Caprylic Capric Triglyceride (Coconut Derived), Glycerin, (Plant Derived), Glyceryl Stearate SE (Plant Derived), Stearic Acid (Vegetable Derived), Propanediol (Corn Derived), Kaolin, Tapioca Starch, Magnesium Aluminum Silicate (Mineral), Simmondsia Chinensis (Jojoba) Seed Oil, Melaleuca Alternifolia (Tea Tree) Leaf Oil, Lavandula Angustifolia (Lavender) Oil, Mentha Piperita (Peppermint) Oil, Cymbopogon Martini Oil (Palmarosa), Citrus Reticulata (Tangerine) Leaf Oil, Helianthus Annuus (Sunflower) Seed Oil, Prunus Amygdalus Dulcis (Sweet Almond) Oil, Butyrospermum Parkii (Shea) Butter, Benzyl Alcohol (Plant Derived), Alcohol (Grain Derived), Dehydroacetic Acid. BODY OIL: Thoroughly Clean Oil Control Lotion, 4 oz. • Kukui Nut Organic Body Oil: Blended with nourishing tropical nut oils for silky, smooth moisturizing and massage. pH balanced. Hypo-Allergenic. 8.5 oz. ORDER TODAY! Ingredients: Certified organic safflower (carthamus tinctorius), coconut (cocos nucifera), kukui nut (aleurites moluccana), macadamia ternifolia, sweet almond (prunus amygdalus dulcis) and sunflower oil (helianthus annuus), alkyl benzoate, tocopherol and tocopheryl acetate (vitamin E), and botanical fragrance. BODY OIL: Kukui Nut Organic Body Oil, 8.5 oz. • Natural Stretch Oil: Your gloriously expanding belly, hips and breasts will soak up the splendid, natural blend of oils to help prevent stretch marks and alleviate the itch, and the light, delicate scent won't worsen morning sickness. Natural Stretch Oil is light and readily absorbable. It's vegan, cruelty-free, and contains no nut oils. Zero toxins and no artificial preservatives, fragrance or color. It's lovely as a bath oil and perfect for perineal massage to help avoid tears and episiotomies during childbirth.. 4 oz. ORDER TODAY! Ingredients: Vitis Vinifera (Grape) Seed Oil, Simmondsia Chinensis (Organic Jojoba) Seed Oil, Borago Officinalis (Organic Borage) Seed Oil, Matricaria Recutita (Organic Chamomile) Flower Extract, Calendula Officinalis (Organic Calendula) Flower Extract, Citrus Sinensis (Organic Sweet Orange), Citrus Aurantium Dulsis (Orange) Oil. • Angel Baby Oil: Angel Baby Oil is a gently absorbable grape seed oil blend that has no nut oils and zero toxins. Hospital recommended Angel Baby Oil is infused with calming organic Chamomile and moisturizing organic Calendula, and has virtually no scent. Perfect for sensitive little noses, ideal for massage or dry skin! No artificial preservatives, dyes or fragrances, just pure natural baby oil for your pure natural baby. 4 oz. ORDER TODAY! Ingredients:Vitis Vinifera (Grape) Seed Oil, Simmondsia Chinensis (Organic Jojoba) Seed Oil, Chamomilla Recutita (Organic Chamomile) flower Extract, Calendula officinalis (Organic Calendula) flower Extracts. Almond Glow Body Lotion Massage Oil: The rich, natural oils that make Almond Glow a wonderful moisturizing lotion for all-over skin care also make it an excellent massage oil. • Almond Glow Body Lotion Massage Oil Almond: Leaves skin firm, relaxed, and amazingly soft, while deliciously fragrant with the scent of almonds. Moisturizes and revitalizes the skin. Excellent for massage. 8 oz. ORDER TODAY! • Almond Glow Body Lotion Massage Oil Coconut: Rich in the antioxidant vitamin E, Coconut Oil is quickly absorbed into skin to give cells a delicious burst of hydration and nourishment. Coconut Oil's light, tropical scent makes it a natural favorite. Excellent for massage. 8 oz. ORDER TODAY! Ingredients: Arachis Hypogaea (Peanut) Oil, Olea Europaea (Olive) Fruit Oil, Lanolin Oil, Fragrance (Natural Coconut), Prunus Amygdalus Dulcis (Sweet Almond) Oil, Tocopherol (Natural Vitamin E). • Almond Glow Body Lotion Massage Oil Lavender: Provides calming effect and its ability to relieve muscle tension. Gently cleanses skin, this multipurpose oil hydrates the skin, leaving a light, delicious fragrance. 8 oz. ORDER TODAY! Ingredients: Arachis Hypogaea (Peanut) Oil, Olea Europaea (Olvie) Fruit Oil, Lanolin Oil, Fragrance (Natural Lavender), Prunus Amygdalus Dulcis (Sweet Almond) Oil, Tocopherol (Natural Vitamin E). • Almond Glow Body Lotion Massage Oil Unscented: Gentle enough for even the most sensitive skin. Excellent for massage. 8 oz. ORDER TODAY! Ingredients: Arachis Hypogaea (Peanut) Oil, Olea Europaea (Olive) Fruit Oil, Lanolin Oil, Prunus Amygdalus Dulicis (Sweet) Almond) Oil, Tocopherol (Natural Vitamin E). MASSAGE OIL: Almond Glow Body Lotion Massage Oil, 8 oz. • Castor Oil Cold Pressed & Cold Processed: Castor Oil, Cold Pressed and Cold Processed Pure, natural emollient oil. Softens and nurtures skin. Ideal for massage into joints and muscles. Castor oil is a natural emollient that penetrates the surface layers of the skin making it softer and silky. • Castor Oil Cold Pressed & Cold Processed:16 oz. ORDER TODAY! • Castor Oil Cold Pressed & Cold Processed:32 oz. ORDER TODAY! 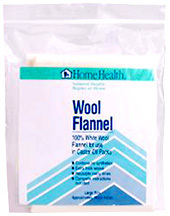 Wool Flannel: 100% pure White Woll Fannel for use in Castor Oil Packs. This extra thick weave contains no synthetics, and is reusable many times. The effects of externally applied castor oil can be enhanced using a piece of wool flannel saturated with the oil and applied to the body. Comes with complete instructions for the preparation and application of a castor Oil Pack. ORDER TODAY! MASSAGE OIL: Castor Oil, 16 fl. oz. MASSAGE OIL: Castor Oil, 32 fl. oz. MASSAGE: Wool Flannel, Large 18" x 24"
MASSAGE: Wool Flannel, Small 12" x 18"
• Comphrey Oil: A natural skin care for people and pets. Use for sprains bruises and swellings. 4 fl. oz. ORDER TODAY! Ingredients: Olive Oil Extract of Certified Organic Comphrey* Whole Plant. BODY OIL: Comfrey Oil, 4 oz. • Herbal Flower Oil Arnica Allay: Arnica Allay can be used to help body and soul to maintain calmness, as well as when there is specific pain and injury. Arnica provides renewal from many kinds of bodily traumas, such as bruises, sprains, contusions, various forms of myalgia, hyperextensions, sports injury and recovery from surgery. For external use only (not for open wounds). 2 oz. ORDER NOW! • Herbal Flower Oil Dandelion Dynamo: Dandelion Dynamo is an excellent tonic helps cut through many forms of congestion and contraction in the body. Dandelion Dynamo can also benefit those individuals with too much intensity and activity, particularly subject to stress and chronic patterns of tension. Dandelion Dynamo is also helpful for many forms of premenstrual or menopausal tension, especially where symptoms of fluid retention exist.. Excellent for full body massage or bath oil. For external use only. 2 oz. ORDER NOW! • Self Heal Creme: Now with Totarol organic preservative, Self-Heal Creme is made with the flower essence and whole plant tincture of the remarkable Self-Heal herb, Prunella vulgaris, and is a paraben-free formula with organic and Biodynamic herbal ingredients. Totarol's potent anti-bacterial activity, it also possesses anti-oxidant and therapeutic properties. Used as a moisturizer and calming skin creme, or as a base for topical application of flower essences and essential oils. • Self Heal Creme: 4 oz. Tube. ORDER NOW! • Self Heal Creme: 4 oz. Jar. ORDER NOW! • Self Heal Creme: 8 oz. Pump. ORDER NOW! Ingredients: Aqua (Water), Aloe Barbadensis Leaf Juice, Simmondsia Chinensis (Jojoba) Seed Oil, Cetearyl Olivate, Sorbitan Olivate, Prunella Vulgaris Flower Extract in Alcohol (Self-Heal Flower Essence), Prunella Vulgaris Plant Extract in Alcohol (Self-Heal tincture), Prunus Amygdalus Dulcis (Sweet Almond) Oil, Persea Gratissima (Avocado) Oil, Glycerin, Silica, Cetyl Alcohol, Glycryl Stearate; Chamomilla Recutita (Matricaria) Flower Extract and Calendula Officinalis Flower Extract, each in Olea Europaea (Olive) Fruit Oil, Symphytum Officinale Root Extract, in Alcohol (Comfrey tincture), Butyrospermum Parkii (Shea Butter), Tocopherol (Vitamin E), Phenoxyethanol, Benzyl Alcohol, Potassium Sorbate, Xanthan Gum, Citrus Aurantium Dulcis (Orange) Oil, d-Limonene, Lavendula Angustifolia (Lavender) Oil, Linalool, Cananga Odorata (Ylang Ylang) Flower Oil, Jasminum Officinale (Jasmine) Flower Extract, Geranium Maculatum Oil. BODY OIL: Herbal Flower Oils, 2 oz. • Golden Moisturizing Oil: This deeply penetrating skin lotion contains only natural moisturizers which are quickly absorbed and helps maintain a healthy skin, free from blemishes. The all-purpose oil with natural moisturizers to enrich every inch of your body. Contains the highest grades of Almond Oil, Olive Oil, Peanut Oil, Vitamin E and Lanolin Oil for increased absorption. Nothing else is added. May be used as a dry-skin treatment, body/facial massage oil, bath oil, hair and scalp oil, make-up remover, nail and cuticle massage oil, pre-shave oil, baby oil, stretch mark avoidance. Protection from exposure to sun, wind or cold. 8 fl. oz. ORDER TODAY! INGREDIENTS: Rainbow Golden Moisturizing Oil is a natural blend of Peanut Oil, Almond Oil, Olive Oil, Lanolin Oil and Vitamin E.
MASSAGE OIL: Golden Moisturizing Oil, 8 oz. • Cayenne Heat Massage Oil: A great massage oil, which is said to increase blood circulation. An external deep heating massage oil for muscles and joints. Extensively used by professional massage therapist. In an extra virgin olive oil base. CAUTION: For external use only. Avoid contact with sensitive areas of the body, eyes & lips to prevent temporary discomfort. Apply liberally & rub into skin in a circular motion. Apply externally as needed or as directed by your health care professional. 4 oz. ORDER NOW! MASSAGE OIL: Cayenne Heat Massage Oil, 4 oz.